2. Spray a large rectangular glass baking dish with nonstick cooking spray. 4. Drain noodles (if using spinach, place it in the colander before you pour in the spaghetti for quick steaming), rinse quickly and pour back into pot over optional spinach. 5. Mix spaghetti, optional spinach, butter, sauce and 2 cups of the cheese until well combined. 6. Pour spaghetti mixture into baking dish, top with the optional additional cup of cheese and the corn flake crumbs. 7. Bake for 30-45 minutes until mixture is bubbling slightly around the edges and crispy on top. 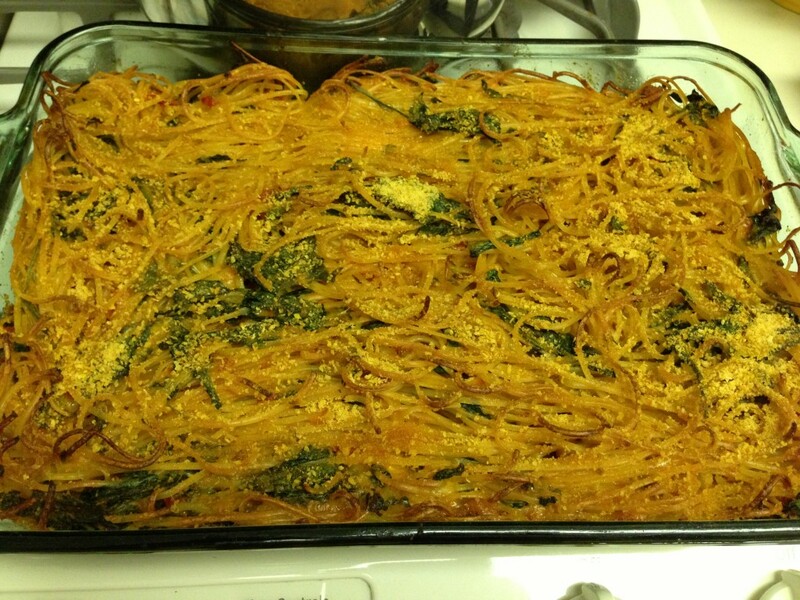 This entry was posted in A Peek Into My Kitchen, meatless monday and tagged #meatlessmonday, baked spaghetti, casserole, easy dinners, kid favorites, lacto-ovo, meatless monday, picky eaters, vegetarian by jessica. Bookmark the permalink. Doing this! Thanks so much!